13:20 GMT: The trial will reconvene tomorrow morning with the defendant's statement. 13:18 GMT: The lawyer wants a postponement, so that he could call further witnesses. A large amount of additional evidence, Lippestad said, was received as late as Friday. 13:17 GMT: Far-Right witnesses will determine if it is only Breivik who holds such views, or there are other subcultures who hold the same views. 13:12 GMT: In the next five days, Breivik will present his views and his motivation before the court. This will explain if he is sane or not. "It is difficult to understand Breveik's perception of the world," Lippestad said. 13:06 GMT: Breivik's lawyer, Geir Lippestad, reminds the court that Breivik did not plead guilty. Tomorrow, Breivik wants to read out loud a supporting document. This will take 30 minutes. 'It is important to hear about his ideology, planning and, last not least, why he did what he did." 13:01 GMT: The prosecutor said he would call Breivik's mother as a witness. 12:51 GMT: The prosecutor is enlisting the witnesses to be called in the next couple of weeks. Nearly 150 people are expected to testify. In total, Breivik's victims are represented by 166 lawyers. 12:41 GMT: The trial has resumed. The prosecutor says Breivik has had 31 police interview, lasting over 233 hours with 1133 pages of notes taken. 12:18 GMT: The court has adjourned for a 20-minute break. The broadcast will resume at 12.40 GMT. 12:08 GMT: After the phone call, Breivik killed at least another 22 people. 12:03 GMT: Record of a phone call is played, Breivik made the call at 18:00 telling the police his name and disposition. At that moment he told the police he wanted to surrender. "My name Anders Behring Breivik. I am a commander of the Norweigain resistance movement. Please could you give me the head of Delta? … Yes, I am at Utoya, I am a person who wishes to surrender. Knights Templar is the name of the organisation but we are part of the anti-communist movement. I have just carried out an operation on behalf of Knights Templar Europe and Norway." 11:53 GMT: Prosecutor says, many people were trying to seek refuge in the cafe; approximately at 17:27 Breivik came to the cafe. Before that he had already killed 17 people (the first shot was made at 17:21). 11:41 GMT: Prosecutor presents exact chronology and details of the killings committed on the island. The reconstruction is built up from texts and calls made. 11:35 GMT: Aerial photos of the Utoya island, parts of the tent camp and a map are being shown. There were 560 people on the island when Breivik arrived disguised as a police officer. The island is about 500m long, 300m wide. 11:25 GMT: Prosecutor Svein Holden recites points of the indictments: indicates where 17 victims were when the blast occured in Oslo , photos are being shown of Breivik's car, the case he used to carry his riffle, the vessel he used to get to the island of Utoya. 11:18 GMT: While CCTV video of Breivik's ride and the explosion in the government quarter is being shown, the camera is focused on Breivik's face, shows wide shot of him. The accused looks calm, his emotions are unclear. 11:13 GMT: The images of Breivik driving the car, the blast and the victims are being shown. There is a ban on broadcasting them. 11:09 GMT: Graphix map is being broadcast showing Breivik's movings in Oslo ahead of the attack, Breivik watches attentively. 11:00 GMT: Proceeding resumes after lunch break, Breivik smiles when takes his seat. Prosecution continue with their opening. 09:50 GMT: After the 12-minute video the court will break for lunch. 09:48 GMT: Breivik was crying as his manifesto video was shown in court. 09.45 GMT: Breivik’s propaganda video is being shown in court right now. The video was uploaded to YouTube before the bombing. Holden warned the media to turn off the cameras if they want to. 09:32 GMT: Pictures of Breivik’s farm are shown. This is the place where he manufactured the bomb that was detonated in Oslo. Police made a bomb following instructions given from Breivik and tested it. Instructions drawn by Breivik himself are demonstrated for the court. 09:28 GMT: Holden continues onto “equipment” acquired by Breivik. Altogether he bought 43 weapon-related items. 09:24 GMT: Breivik smiles as the picture of him in parade uniform is shown in court. He bought 36 items from 8 countries to make his uniforms. It said "Multiculti [sic] traitor hunting permit" on a badge attached to his uniform. 09:20 GMT: The prosecution speaks of Breivik’s three-part manifesto titled “2083 – A European Declaration of Independance". 09:14 GMT: The prosecutor says Breivik was playing World of Warcraft (WoW) "full-time" between the summer of 2006 and summer 2007. He goes on to describe it as a violent game. When a screenshot of his WoW character is shown on the screen Breivik smiles. 09:12 GMT: Prosecutors opening statement to last for four hours. 09:07 GMT: Holden says that the Knights Templar organization Breivik claims to be a part of “does not exist”. 08:55 GMT: Prosecutor Svein Holden reads out Prosecution Opening Statement. He speaks of Breivik's biography, his education, work experience and especially the businesses that generated his income for the years prior to the tragedy. 08:48 GMT: The court warns that video clips and sound recordings will be played in court. Those are recordings from the Oslo blast and from massacre on Utoya. The judge described the footage as “strong”, so much so, that it is not allowed to be broadcast by the media. 08:46 GMT: Court is back in session. 08: 26 GMT: 15 minutes break announced. 08:25 GMT: The prosecutor finished reading the list of victims and the injuries they’ve sustained. 08:11 GMT: Prosecutor is still reading out the names of killed and injured. Breivik remains indifferent. 07:56 GMT: According to Breivik’s manifesto, clenched fist salute is the salute of “Templar knights”, symbolizing“ strength, honor and defiance”. 07:52 GMT: About half of the roughly 200 seats in the court room have been set aside for survivors and relatives of victims. 07:50 GMT: The defense plans to call radical Islamists and right-wing extremists to the stand to try to show that Breivik is not alone with his world view. Psychiatrists who examined Breivik will testify on his mental health. 07:48 GMT: After opening arguments on April 16, five days have been set aside for Breivik's testimony. Then forensic experts and coroners will testify for the prosecution, as well as survivors and witnesses from the bomb scene and Utoya. 07:49 GMT: Breivik has admitted to the attacks, claiming they were necessary to protect Norway from being taken over by Muslims, but has rejected criminal guilt. 07:47 GMT: Breivik will be tried by a panel of five judges. Public prosecutors Inga Bejer Engh and Svein Holden are presenting the case against him. Breivik's defense team is led by Geir Lippestad. The trial is expected to last 10 weeks. 07:45 GMT: If convicted Breivik would face a maximum sentence of 21 years in prison, though sentences can be extended if a criminal is considered a menace to society. 07:36 GMT: The key issue to be resolved in the 10-week trial is the state of Breivik's mental health. This will decide whether he will be sent to prison or to psychiatric care. 07:30 GMT: Breivik shows no emotion as Prosecutor reads out horrific injuries of victims on Utoya Island listed in excruciating details. 07:18 GMT: The Prosecutor reads out the names of those killed and injured. Listing their locations at the time of the attacks, injuries sustained, and details of how victims died. ­07:15 GMT: The anti-Muslim militant described himself as a writer, currently working from prison, when asked by the judge for his employment status. ­07:15 GMT: Breivik also said he doesn't recognize the authority of Judge Wenche Elisabeth Arntzen, because he said she is friends with the sister of former Norwegian Prime Minister and Labor Party leader Gro Harlem Brundtland. 07:14 GMT: "I don't recognize Norwegian courts because you get your mandate from the Norwegian political parties who support multiculturalism,'' Breivik said in his first comments to the court. ­07:13 GMT: Prosecutor reads the indictment. Breivik is charged with terrorism and premeditated murder for a bombing in Oslo's government district, killing eight, and a shooting attack at a political youth camp, killing 69. 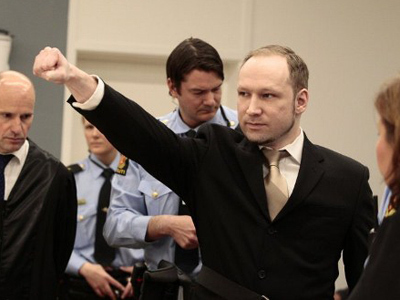 ­07:09 GMT: Anders Breivik entered courtroom and gave clenched fist salute as his trial on murder charges begins in Oslo. ­07:08 GMT: Trial of Anders Behring Breivik, who killed 77 people in Norway, begins in Oslo.